With their inefficient terminals and bloated footprints, today’s airports are typically ill-equipped to adapt to sharp increases in demand, scarce land availability or new flight technologies. 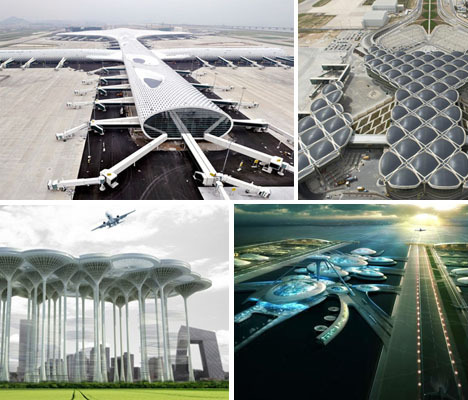 These 13 futuristic airport designs address current and upcoming air travel challenges, from beautiful expansions currently under construction to fantastical concepts that accommodate vertical lift-off. 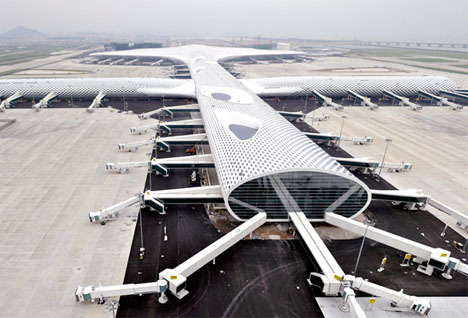 Beijing is in dire need of new airports, but also doesn’t have a lot of acreage to spare. 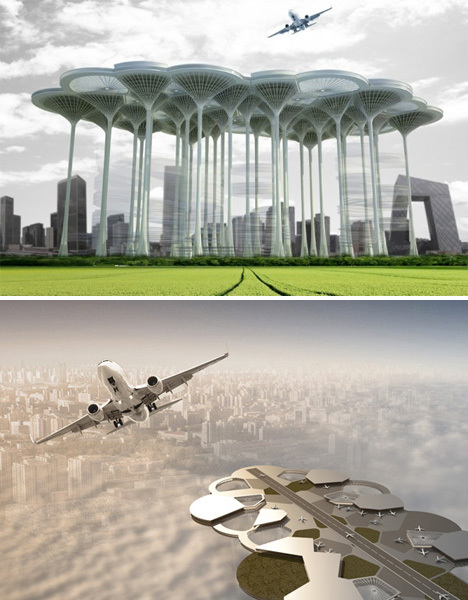 This concept for the 2012 eVolo Skyscraper Competition solves both problems with ‘airport skyscrapers’ shaped like giant mushrooms. Not only does this free up the space below, it also effectively reduces the length of the runways since wind speed is higher 450 meters in the air than it is at sea level. 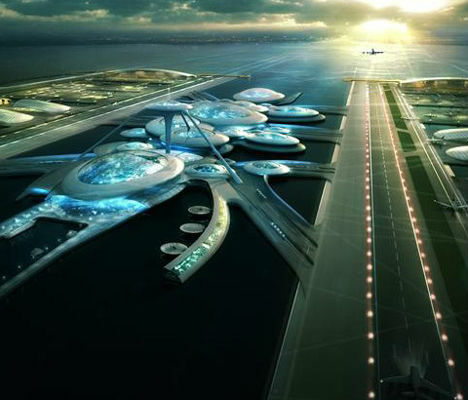 Using the surface of rivers and the sea also frees up precious land, as illustrated in this futuristic airport design by architecture firm Gensler. Envisioned for the Thames River, the London Britannia consists of a series of rounded pods connected to four floating runways anchored to the sea floor. Underground tunnels would connect passengers to the city and to European rail networks. 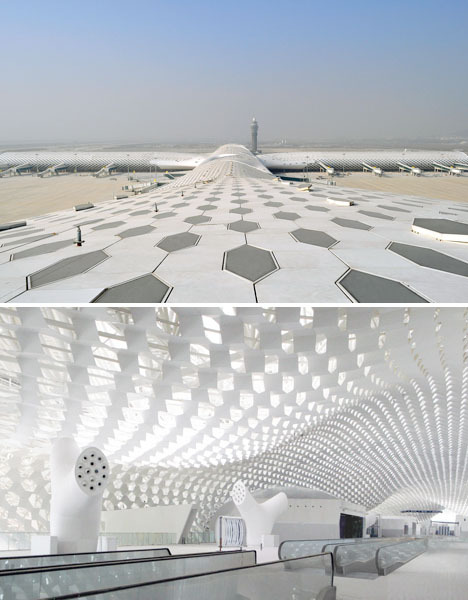 Taking inspiration from both the natural form of a manta ray and the more obvious shape of an airplane, the Shenzen airport extension in China is covered in thousands of hexagonal skylights across a steel and glass canopy, creating a honeycomb pattern within the undulating all-white interior. 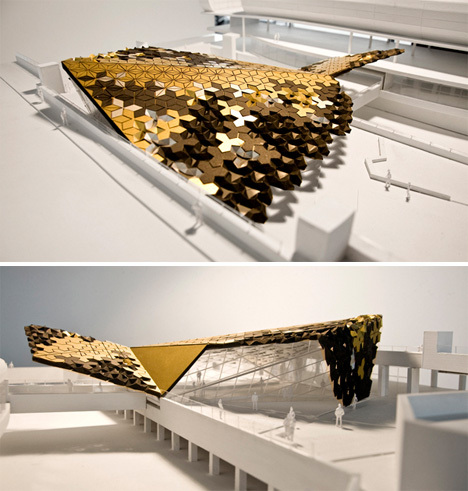 A modular geometric roof consisting of brushed metal in three golden shades makes a big impact on the Malpensa Airport, creating a covered area that serves as an exhibition space and pedestrian walkway between the Expess Train Station and Terminal 1 of the Milan Airport.